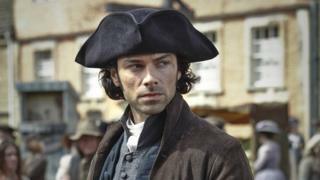 Poldark is to return for a second series with Aidan Turner back in the lead role, the BBC has confirmed. The period drama remake - a ratings hit for the BBC - has been recommissioned for another 10 episodes. Turner has won legions of fans as the brooding, scythe-wielding Cornish hero Ross Poldark. The show has helped BBC One record its highest ratings share for the first three months of the year in a decade. Series two will be based on the third and fourth books of Winston Graham's series set in 18th century Cornwall. Eleanor Tomlinson will also reprise her role as Poldark's beloved Demelza. Poldark was originally made for TV in the 1970s, with Robin Ellis in the lead role, and hooked audiences of 15 million. The recent adaptation pulls in around eight million viewers per episode, helping to boost BBC One's overall ratings for the first quarter of 2015. Programmes like Poldark, EastEnders, and Still Open All Hours helped the corporation win 25.2% of viewers in peak times. Call the Midwife averaged 10.3 million viewers making it the most watched drama series across all channels so far this year. BBC One controller Charlotte Moore said it had been "an outstanding start" to the year. She said: "We aim to maintain that momentum and continue to move with the times and bring audiences a range of distinctive, high quality programmes that feel relevant and reflect the diversity of modern Britain." Poldark: Could Aidan Turner spark a surge in scything? Video Can Poldark remake recapture those glory days?